Are you thinking about pampering yourself or your family? Perhaps Neptune Hotels might just meet all your requirements. This is an all-inclusive five star hotel that offers swanky fitness centre, a dozen fancy restaurants and bars, breath-taking entertainments and activities, plush spa centre, seven swimming pools, private beach, mini club and mini adventure, professional animation team and nine categories of rooms and suites. It also offers doctor on site, car and scooter rental, express check-in & check-out, internet lounge, shopping arcade, boutique, ATM and more. Neptune Hotel is equipped with 569 rooms, divided into 9 categories of rooms: Single and Double Rooms, Superior Double Rooms, Family Apartments, Superior Apartments, Superior Apartment, Executive Apartment, Executive Apartment, Suite and Meltemi Suite. Rooms are spacious and modern, all furnished with modern facilities. Common features are en suite bathroom, shower, magnifying mirror, hairdryer, bathrobes, slippers, toiletries, direct dial phone, air conditioning, safe deposit, TV with satellite connection mini fridge and coffee/tea maker — baby cots are provided on request. Each room has a balcony that offers beautiful views of the area around. It houses four restaurants that are Taverna the Greek restaurant that serves lunch and dinner, Proteas the a la carte restaurant that serves dinner, Neptune that serves breakfast and dinner buffets, and Osteria that serves Italian cuisine at lunch and dinner. It has two beach bars, Odysseus Beach Bar and Troja Beach Bar that open from 10 A.M. to 6:30 P.M. Furthermore, it has one café, kafenio Café that serves Greek beverages and two poolside bars Olympic Pool Bar and Palace Pool Bar that serve cocktails, mocktails, fruit juices and other beverages. Other than these, Palace Bar opens till 4 A.M. and hosts shows and serves alcoholic drinks, Vienna Bar is an adults only bar (guests must be above 12 years), and Apollon Theatre Bar opens till11 P.M. where more of the animation programme takes place and beers, cocktails and other alcoholic drinks are serves. Neptune Hotel offers residence pool, kids’ pool, village pool, Olympic pool, indoor heated pool, water-treading pool and mini water land for kids. 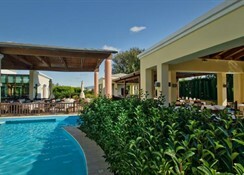 Outdoor pools are all surrounded by gardens, sundeck, parasols recliners and loungers. Speaking of recreation facilities Neptune Hotel offers, you can look forward for basketball, badminton, beach volleyball, pool table, boccia, archery, darts, football and table tennis. Its fitness centre offers Pilates, stretching, step aerobics, belly, legs and buttocks exercises, aquafit and more. Other activities are sailing, surfing, tennis courts, squash, mountain biking and golfing. There is a mini club for kids between the ages or 4 and 12 years, where scores of activities are conducted exclusively for kids. Also, the animation team ensures that you are entertained throughout the day and in the evening. 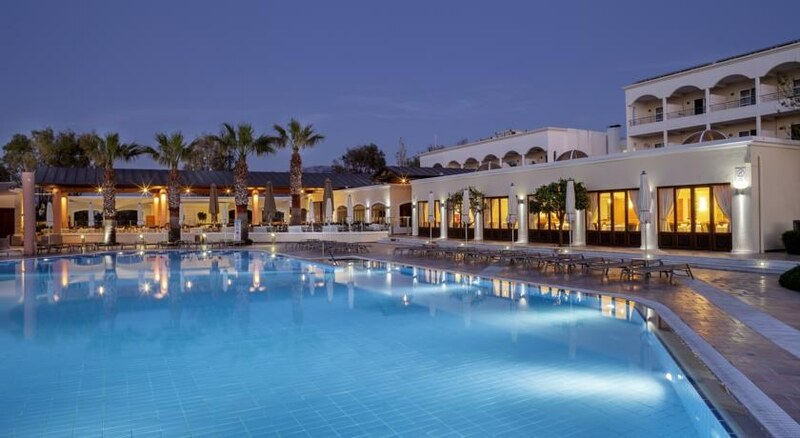 Suitable for families, couples and adult groups, Neptune Hotels – Resort, Convention Center & Spa is located on the northern coast of Kos. 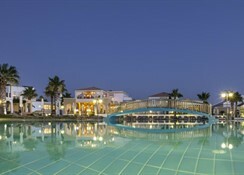 The hotel is situated right on the sandy beach and 5 km from the picturesque fishing town of Mastihari. 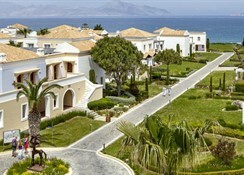 The property is scattered around the beach and offers remarkable views of the surrounding. The International Airport of Kos is 8 km away, which takes about 10 minutes on car and all important landmarks in Kos is within 18 km range. The nearest bus stand is about 300 metres away from the hotel. *** Check out the spa that spreads across 1600 sqm. *** Room service is available between 7:30 A.M. and 11 P.M.